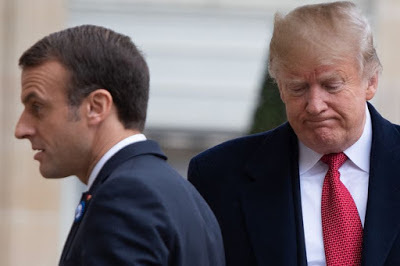 The dying bromance between Donald Trump and Emmanuel Macron was finally buried today, as the US President blasted his French counterpart in a furious Twitter rant. And his lengthy list of grievances go all the way back to World War II. But there could be a surprising reason for at least one of the US President's angry messages. He laid into President Macron's approval rating, his record on unemployment - and the tariffs France puts on imported wine from the US. Trump hit back at reports that he cancelled a World War I cemetery visit because it had been raining. He reacted to attacks on his nationalist agenda made by Macron, who said during the commemorations: "Patriotism is the exact opposite of nationalism." And in an astonishing broadside Trump said France had been "learning German before the US came along." The US President wrote: "Emmanuel Macron suggests building its own army to protect Europe against the U.S., China and Russia. But it was Germany in World Wars One & Two - How did that work out for France? They were starting to learn German in Paris before the U.S. came along. Pay for NATO or not!" Attacking President Macron, he added: "The problem is that Emmanuel suffers from a very low Approval Rating in France, 26%, and an unemployment rate of almost 10%. He was just trying to get onto another subject. By the way, there is no country more Nationalist than France, very proud people-and rightfully so!...MAKE FRANCE GREAT AGAIN!"